Very light scent. 3 to 4 Feet. June flowering. This rare and uniquely beautiful lily is a cross between a Trumpet Lily and an Asiatic, the first such hybrid we have ever offered. 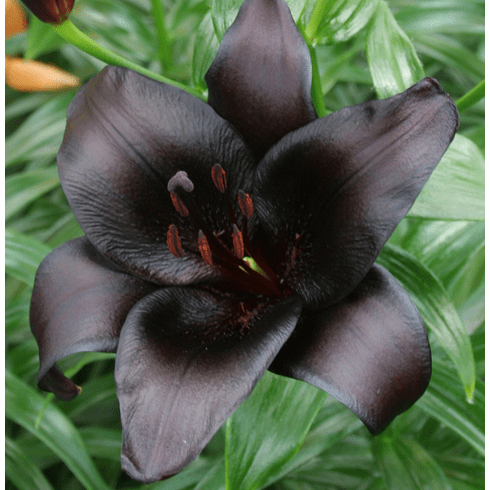 These flowers are described as being "violet black", but in light shade appear as nearly black. Flower form is reminiscent of the mother, an upfacing trumpet. Some who have seen it say they can smell a slight fragrance, but to our noses, any fragrance at all is fleeting. This is a June bloomer that reaches about 4 feet, but when well settled could grow taller because of the trumpet genetic background. Mid / Late June flowering here. Bulb Size - Our standard for bulbs of this Asiatic Hybrid Lily Bulb cultivar ranges from Premium-size (16/18 cm) to Exhibition-size (over 20 cm).